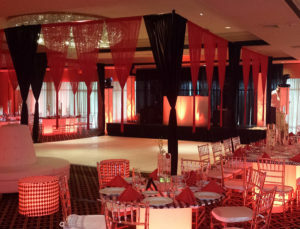 When it comes to your event, could color be the thing holding you back? Paying attention to your event decor could yield you great rewards. Like it or not, humans are visual creatures, and the colors used can really have an effect on how much attention we give them. Just look at fast food chains like McDonald’s or Wendy’s, which utilize red and yellow color schemes to stimulate hunger and ultimately get customers to pull into their drive through. So, how can you use color to send the message you want in an event and achieve your desired results? Working with color on your side can actually make a big difference! Believe it or not, experts say that different color combinations and using different colors can really help to set feelings and ideas in the people attending an event. This is because different colors can create a different mood in the person, whether they’re aware of it or not. Different combinations of color can deliver different results, so read on to find out the top tips for helping you do this. Figuring out the mood or feeling that you want guests to experience and what message you want to accomplish and then match the color up. It’s the most efficient way to figure out which colors you’re going to use and will help you make it work. Since colors can communicate so much, you can go on and pick your theme. Go with orange for energy and fun, green for balance and growth, yellow for energy and communication, brown for grounding, blue for calming and professionalism, and figure out what colors are going to work for what you want to communicate. Chroma is the brightness of the colors you’re going to be using. Should you go soft or bright? Figure out what brightness may be right for your brand. Generally this will be a pretty easy choice. Adjusting the chroma may help make your colors exist in harmony. Also, the contrast levels between the colors you’re using will have a big effect. Low contrast is calming, while high is more energizing. Try to align the feeling of the shades you are utilizing with the overall mood of your business, product, or brand, and you will have great results. McDonald’s has the market on red and yellow, and putting those together may cause attendees to think back to them instead of you– and maybe even go get a burger. Change up the color tones and you can create standout shades that have a great effect. If you find a color combo that you like, go for it– only you know whether it is ultimately the right call for you. If you have sponsors at an event, make an effort to showcase their signature color if there is one. It’s a nice touch and standard practice at events.